Single girl moves to New York to follow her dreams. Meets man of her dreams, marriage and children ensue. Marriage+ full time job + 2 beautiful boys = 1 hectic, beautiful, crazy, amazing life. Just another day in the life of a BadAssMama. Sherice knows about the power of resilience. Whether rising from the public schools of Richmond, California to graduating from Harvard University; or facing a double mastectomy at the age of 37, Sherice tackles each challenge with drive, determination, faith and a healthy dose of sarcasm. An inspirational leader with nearly 20 years of experience in marketing, brand management, organizational development and executive coaching, Sherice currently serves as Sr. Vice President of the consumer products division of a major kids and family entertainment brand. Torres also serves as BadAssMama-in-Chief of BadAssMama Enterprises, Inc. She is a regular contributor to WorkingMother.com, WhatTheFlicka.com and a syndicated contributor on BlogHer.com. Sherice is an avid runner, completing several full and half marathons from coast to coast – including the ING New York City Marathon and the Nike Marathon for Women in San Francisco. She has been an active member of Team in Training, raising funds for cancer research with the Leukemia and Lymphoma Society. Her most recent fitness addiction is to Bikram Yoga, practicing 3-4 times each week. 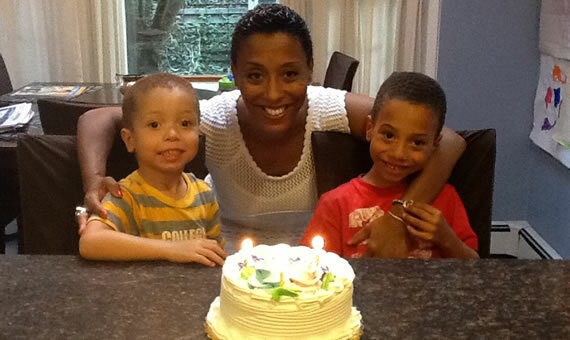 Torres currently lives in New York with her husband and two sons, and journals her (mis)adventures in parenthood on her blog, The BadAssMama Chronicles. Sorry, Sherice hasn't written anything yet.